I finally entered the electronic cutting age this year and got a Silhouette Cameo for my birthday, Woohoo!! 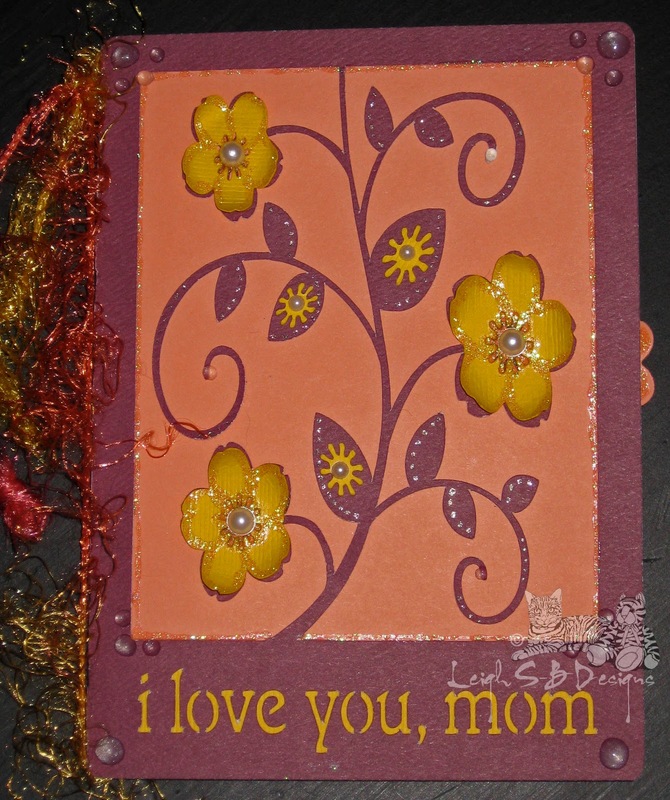 The very first cutting project I did was my Mom's Day card for my Mom. She lives in the UK so I didn't get to go as elaborate with embellishments and dimension as I would have liked to. Here's some pics of the final result. The design I used is available in the Silhouette Cameo library in a square format. I altered the size in the Silhouette design software and cut out the window flower frame with the sentiment included from textured burgundy cardstock and then re-cut just the flowers in textured yellow cardstock. 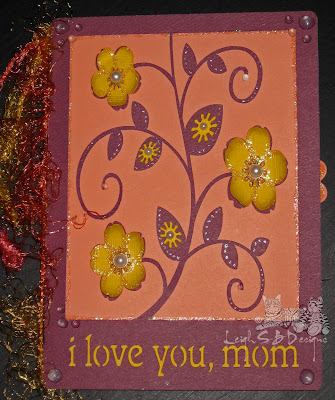 Back the window cut out with peach cardstock and put yellow cardstock behind the sentiment. Add details with a clear glitter gel pen to the leaves and stems and yellow and peach glitter glue to the flowers and around the inside edge of the window cut out. 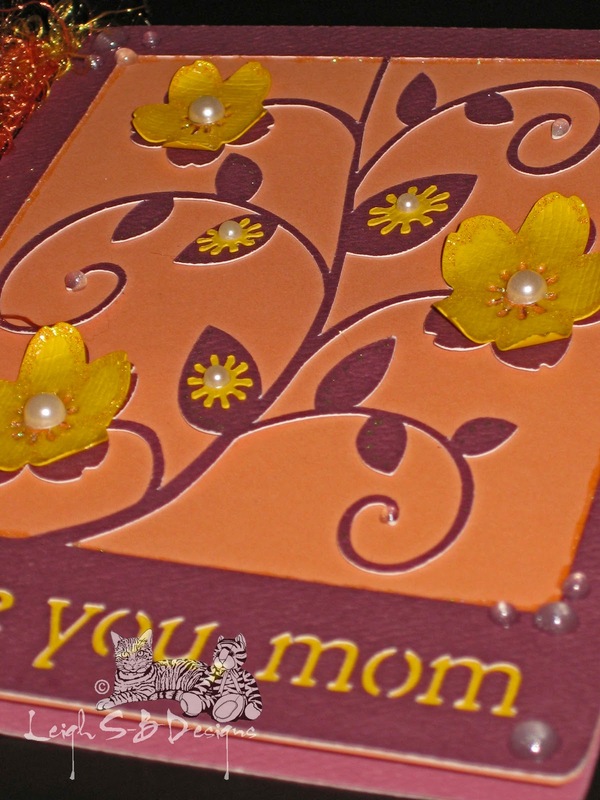 Curl the petals of the yellow flowers and adhere them to the card front with craft glue and embellish all the flowers and leaves with self-adhesive pearls. Embellish all the corners of the card with a Magic Transparent White Pearl Pen. Die cut out a Spellbinders Fancy Tag 2 from peach cardstock and stamp the sentiment from the Daisies set available at Blockheads Paper Arts with Memento Tuxedo Black ink. Adhere the tag to the inside of the card with permanent adhesive tape and embellish with more glittery flowers and glitter glue. The tag was a little bit bigger than the card so I got creative and hooked the right hand side over the edge so it peeks out when the card is closed. I finished off with variegated fluffy fiber wrapped around the card fold. 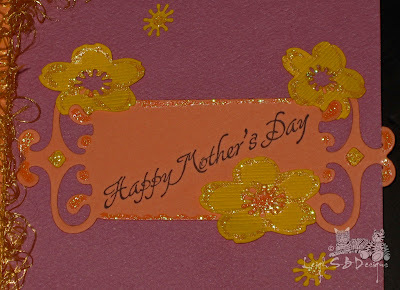 Love the flowers - my soft spot :) Beautiful card - we also celebrate Mothers Day today here in South Africa :) Thank you for joining us at Penny's Paper Crafty Challenge Blog this time! Beautiful card! Thanks for playing along with us at Raise the Bar! Your mom sure is lucky! And you are, too, getting this electronic cutter. I know next to nothing about them, but they seem pretty cool. Your card is so pretty for Mum! Hope you are well, Leigh. Super beautiful creation! THanks for sharing your inspiration with us at 4 Crafty Chicks!! Leigh: Your entry is wonderful! Thank you for joining us at Simply Create Too for our Challenge #13 - Mother's Day [or Feminine] Challenge. Leigh this is so pretty! Thank you for joining in on our Mother's Day challenge this week at Raise The Bar! I can peek now because i have got it, thank you for making me my wonderful mom card! Gorgeous Leigh! love all the elements you used, wonderful design! Thank you so much for linking up @ Inspire Me Fridays! sorry for the late reply, we were on vacay for the month of May and I'm desperately playing catch up! forgive me please!